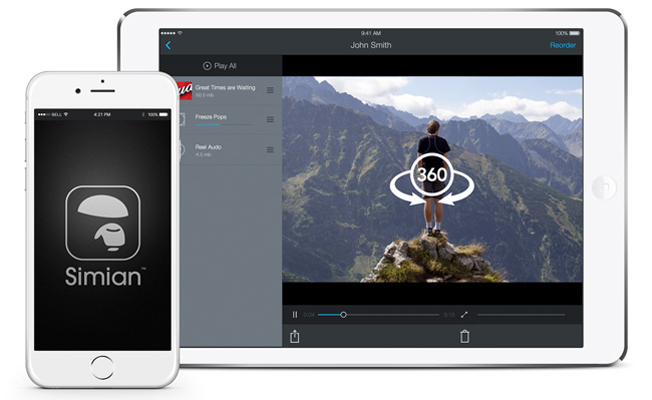 Creative companies can now present and market 360/VR video on any platform, including iOS. Simian, the leader in innovative video sharing and collaboration solutions for the advertising, film and media and entertainment industries has expanded their 360º Video and Virtual Reality capabilities to include iOS devices, which do not natively support 360º/VR Video. In 2015, Simian introduced Simian Now!, a hybrid app that enables users to download and present offline. With this update, Simian Now! will now support 360º/VR Video. In addition, users can also opt to view in stereoscopic for VR headsets. Simian Now! is free at the App Store and anyone receiving a Simian presentation can download it. According to Simian Reel Insights 2015, upwards of 74 percent of creative companies use iOS devices, however, iOS does not natively support 360/VR videos. This presented Simian with it’s primary challenge. Since immersive video has proven to be an engaging medium, marketing 360º/VR Video on iOS is a must. Previously, the only way to do this was via native apps like Facebook – which obviously is not an optimal option. “When developing our 360º/VR Video player strategy, one of the biggest challenges the 360º/VR marketing teams faced was that making sure videos were on a mobile device. This of course included Apple, since the preferred platform for most creatives and CMO’s." says Brian Atton, Simian cofounder and COO. To learn more about Simian’s first-of-its-kind, complete 360º/VR Video support and workflow solutions for business and creative teams visit: http://evolve.gosimian.com/360-vr-video-support. For those who create video, Simian provides an ever-evolving video sharing, presentation, collaboration platform designed by and with industry leaders. Simian’s powerful, all-inclusive solution goes beyond the industry standard for online media sharing and workflow for business and creative teams. Which cut worked better, Version 2 or Version 3? How about that transition – did it flow better in Version 3, or Version 4? And that matte that looked a little off, did it work right in Version 6 or was it in Version 12?